My first experience with this machine dates 5-6 years back to my prime time in Sydney, at Wine Odysessy, which opened the door to the world of wine for me. They held wine classes where people could learn about the process of making wine with comprehensive materials and videos and go into an aroma room and smell all the aromas detected in wine before going downstairs for wine and food degustation. Their food pairings are exquisite and I loved the concept that people could have the chance to sip different wines at once to compare them and to taste exclusive wines that people can’t afford easily. I assumed that the technology would be either a German or American invention but it turned out to be an Italian invention. Anyway, to revisit the old experience, I went to Max Bordeaux with the excitement of tasting famous Premiere Grand Cru wines that I wouldn’t have a chance to sip otherwise. After studying and tasting wines in Bordeaux for some time, I was very curious to find out what all the fusses around Latour, Angelus, Petrus, Chavel Blanc, and such and such were about. Blow the entire €30 credit for one small sip of Latour sounded alright at first. But then, I got hesitant with the worry that I might get very disappointed. So I walked away from the premieres and started from the St-Julien dispenser. The first glass was Château Ducru Beaucaillou 2001. It was impressive with a powerful structure and flavours and I was glad that I tasted it. 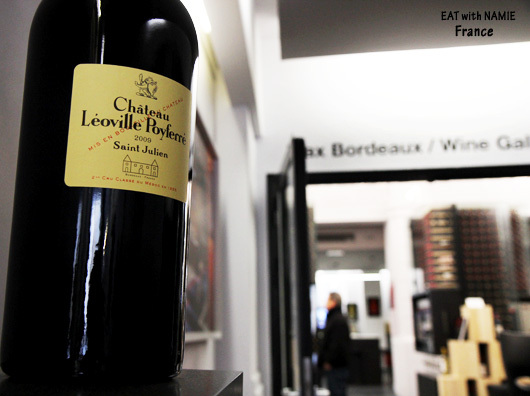 Next, Château Leoville Poyferre 2006. I’m just going to list the tasting notes written in my notebook; lovely deep purple with a bouquet of blackberries and violet, very full mouthfeel, smoky and tannic. Not rounded. Can wait for 5-10 years. A nice shot from a friendly assistant. BUT I was thinking how much I hated the way the machine splashed the liquid into the glass instead of pouring GRACIOUSLY. I don’t remember it being so splashy from my old experience. Also, having a machine pour wine didn’t seem very pleasant, maybe because my taste had changed or the trick of how the machine works. The next was Château Langoa Barton 2006. WHAT!!! Nutty! Hazelnuts in my glass! What is happening? It can’t be right. Suspecting the impact of gas, I let the wine sit for a moment while pouring another glass, which was Château Pichion Longueville, Comtesse de Lalande 2008 from the Pauillac dispenser. I returned to Langoa Barton 2006 and the nutty aroma had subdued but still with a little trace left. Apart from that nutty and mushroom-like aroma, it had lovely fruit and rose aromas on the nose and the taste was full, dark and lush with licorice, tobacco and woody undertones. The finish was round, long, elegant and beautiful. On the other hand, the cassis and cherry fruit forward Pichion Longueville was quite weak in terms of tannins and finish in comparison to the Langoa Barton. And there was an unusual aroma, a kind of fruit, that we were not sure about, so we asked the staff in charge what kind of aromas she detected. She, instead of giving a direct answer, checked the label of the wine first and described the taste of the wine. We were slightly annoyed by the fact that she had to know which wine it was to be able to recite standard descriptions. There is an additional note: “white peppercorns” and ” fruity and short – typical of 2008 vintages” according to my Bordeaux insiders. I tasted another Pauillac, Château d’Armailhac 2007, which was fruity and smooth, well.. typical and nothing bad to say about it but I wasn’t so impressed for the price. The experience left me wonder again if I should still try one of the big names, and I eventually came to the final decision that I should stick to St-Julien and Pauillac this time and come back for Margaux and the others later. So the last glass was Château Cheval Blanc‘s second wine, Le Petit Cheval 2005, which caused some confusion. First off, the smell was so strange and unpleasant, no trace of fruit and simply wet grass, hay and cabbage, that we were sure it was a bad bottle. We asked the staff to check it, so she poured herself a glass, sniffed and sipped it and said it was normal and was due to the high 50% of Cabernet Franc in Cheval Blanc blends. Well, I wouldn’t pay €170 for the bottle even if I had the money. Apparently, that is the style of the old prestigious label, Cheval Blanc, which has been trying hard to remain in the Premiere Grand Cru group but is recently falling out of favour. 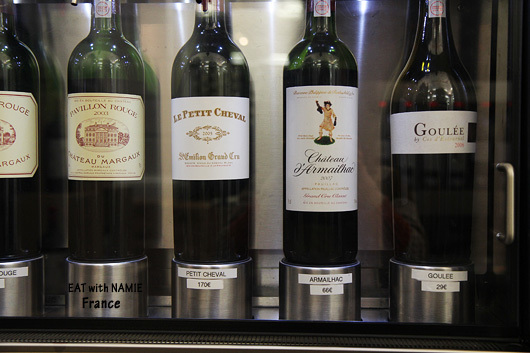 To sum up the Enomatic tasting, in my humble opinion, this wine dispenser is not suitable for aged wines as the instant insertion of gas can disturb the chemical components that have been established in the wine even though it is claimed that argon gas doesn’t have any altering effect on wine whatsoever. I think young wines might benefit from this machine as the volatile chemicals can evaporate by the shock of gas, which I’m not so sure about. So I am interested to know what others think of the Enomatic machine and I will wait for more knowledgeable people to verify my analysis in this post. My last word…I prefer my wine to be poured, not splashed. I had wines from those machines a few times – those where some pretty young and indiscreet wines, so I didn’t notice any artifacts, but then again those were very simple wines. I wouldn’t say that those machines are widespread in US, so it is hard for me to generalize. Thank you for the input. 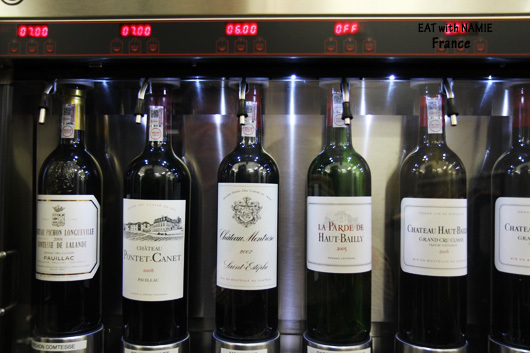 Here in Bordeaux there are already 3 wine bars with those machines and seem popular with young people. 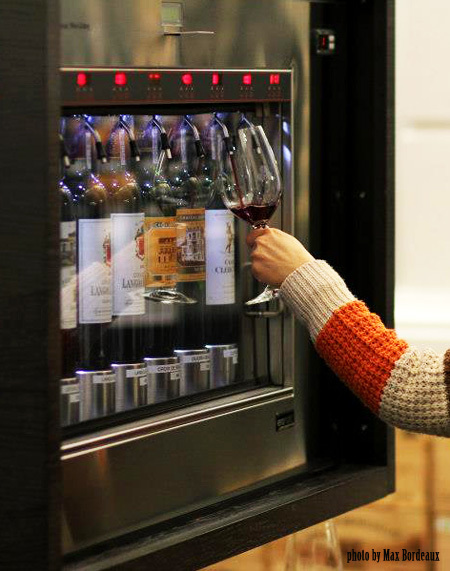 It is a great invention anyway, which allows people to taste many wines at once and choose the wines people want to drink in full glass.